Youth Ministry and Technology. . . How The Electronic Age Has Mis-Shaped Our Kids. . .
Something said by media critic Marshall McLuhan may have initially fallen on deaf ears, but its truths scream loudly about the contemporary power of media, technology, and electronic tools. 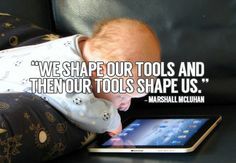 McLuhan once said, “We become what we behold. We shape our tools and then our tools shape us.” Now, almost fifty years later, the proof is in the pudding. When we look in our cultural rear-view mirror at McLuhan’s theory while we speed through the landscape of today’s world, we realize that McLuhan was in many ways a prophet. And while we were foolish to ignore McLuhan’s observation than, we’d be even bigger fools to not consider McLuhan’s words now. . . especially for those of us who do youth ministry. Really? You bet! I was reminded of this over the weekend as I started reading through an updated version of theologian John Stott’s classic 1982 book on preaching, Between Two Worlds. One of my seminary textbooks, Between Two Worlds was really a book about the preacher’s task of knowing both Word and world, and the ways in which we are called to bridge the gap between Word and world by communicating with an eye to missional contextualization. Recently, Greg Scharf updated and abridged Between Two Worlds into a newer book with the title The Challenge of Preaching. It’s good. . . and it’s a book youth workers should read. . . but probably won’t. While we may not find ourselves in the church pulpit every week, our relationships with kids do put us in the pulpit 24/7 as we engage with them in the everyday comings and goings of life. Yes, we are preachers. So what does Stott have to do with McLuhan? In the first chapter of The Challenge of Preaching, Stott addresses three specific challenges to preaching occasioned by current cultural realities: hostility to authority, the electronic age, and the church’s loss of confidence in the Gospel. That last one is a frightening reality, but what I want to pass on here is the way in which Stott’s brief yet astute analysis of the electronic age offers wisdom to those of us who need to know how our technological tools have shaped the kids we minister to. Stott says, “The past fifty years have seen radical changes in methods of communication, and these have had a profound effect on the church (our kids!). The effects are felt worldwide, even in locations where electronic media have not yet penetrated deeply.” Stott then lists five specific effects. . . and we need to listen up! He is describing our students. He is describing our students’ parents. He is. . . I fear. . . describing us. First, people have become physically lazy. The implications here are many, but he specifically mentions how we question why we even need to go out to a church when we can “worship” on our own in front of the TV or smart-screen. (Why in fact, do we need to leave our screens to go out and do anything?!?) I would go a step further and say that a lazy spiritually is a dying spirituality. Second, people have become intellectually uncritical. This one’s especially scary. We don’t think. Maybe our physical laziness has carried over into our brain cells. Specifically, Stott says we want to be entertained rather than made to think. Sound like anyone you might know or minister to? Third, people have become emotionally insensitive.Communication theorists talk about the massive volume of stuff we see and hear, and how that serves to desensitize and anesthetize us to stuff that used to and still should horrify us. Stott writes, “we witness the horrors of war, famine, and poverty, but have become skilled in emotional self-defense, distancing ourselves from others’ pain.” I would add to that list things like abortion, death, murder, racism, violence, and all other kinds of suffering. To be honest, this is the one that really hits home for me personally. In recent years, I’ve become increasingly troubled by what seems like a kind of hardening that’s taken place in me, leaving me feeling less empathetic/sympathetic than younger versions of myself. Fourth, people have become psychologically confused. We spend so much time locked in to living in the virtual world of our screens that we are increasingly unable to switch out into the real world. . . the world where we can and must enjoy the quiet while hearing and worshiping God. Okay youth workers. . . are you seeing this? And if so, how are you pushing back? Or, are you complicit through your ministry approach and methods? This stuff is so significant that it cannot be ignored. To do so would be foolish. If we don’t push back, we are actually allowing kids to be nurtured further and further down these destructive paths. So, here’s my challenge for today. . . prayerfully ponder how our technological tools (good things, for sure) have shaped your kids. Now, prayerfully ponder how you can push back in ways that help them shape their use of these tools to the glory of God, rather than allowing the tools to shape them into the image of things that are in no way good. I want to continue this discussion over the next couple of days. In my next post, I want to look at how this same stuff has mis-shapen us as people in youth ministry. And in the post after that, we’ll take a look at some suggestions on how to best push back. ← Pitbull, Mediocre Music, and the Call to Create Good Culture. . . Thanks for this post, Walt! We continue to see the reality of what you’re addressing here both in our home and in our youth ministry. Looking forward to more of this conversation and how we can best push back together. Taking technology away from kids is not the answer…it only leads to more lies and secrecy and distrust between students and parents. I’m praying and seeking for better ways to handle this along with you! Thanks again!